The annual checkup from the state-federal Chesapeake Bay Program, released Tuesday, shows that 42% of the Bay and its tidal tributaries met water quality standards during the 2015–17 assessment period. That’s up 2 percentage points from 2014–16 and 14 points from 2011–13 during the fallout from Hurricane Irene and Tropical Storm Lee, and it’s the best reported since the Baywide monitoring program began in 1985. 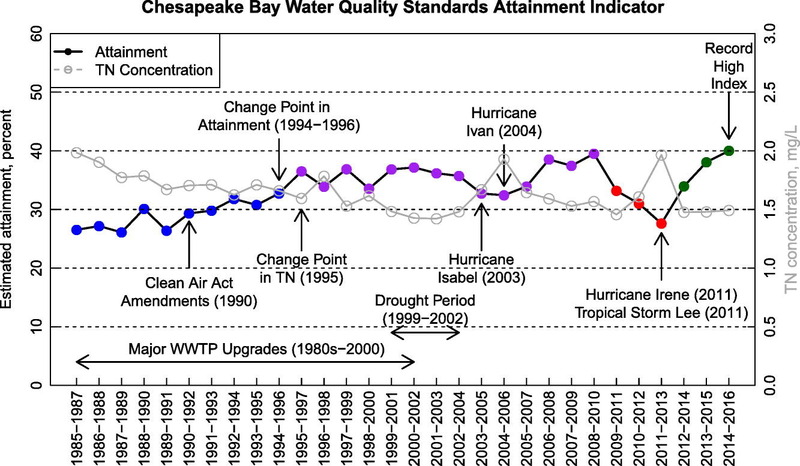 But the authors of the annual Bay Barometer report also warned that the Chesapeake’s overall health likely declined during a water-logged 2018. That slug of record rainfall, with the surge of nutrient and sediment pollution it washed into waterways, won’t be registered until next year’s report. “That probably sums up to a poorer score in the next assessment,” said Peter Tango, the Bay Program monitoring coordinator. And, a recent assessment of progress toward 2025 Bay nutrient and sediment reduction goals showed that, overall, the region is not yet on track for success, especially for reducing pollution from stormwater and agriculture. Ultimately, those nutrient reductions are needed to achieve the Bay’s water quality standards. The improved water quality was among the best news found in the Bay Program’s annual report card, which tracks progress toward meeting more than 30 pollution reduction and restoration goals established in the 2014 Chesapeake Bay Watershed Agreement dealing with everything from environmental education to fish passage to black ducks. The agreement was signed by the six states that drain into the Bay — the District of Columbia, the U.S. Environmental Protection Agency and the Chesapeake Bay Commission, which represents state legislatures. Since 2010, more than 1.3 million acres of land throughout the watershed has been protected from development through conservation arrangements. That’s 68% of the 2 million-acre goal. The program has already topped its goal of opening 1,000 additional miles of streams for fish passage. Since 2009, sediment loads have been reduced 10% and phosphorus loads are down 21%, both meeting their 2017 targets. Still, the report found plenty of restoration shortfalls: Only 25% of streams in the Chesapeake’s 64,000-square-mile watershed registered fair or better health; 83% of the Bay and its tidal tributaries were fouled by toxic chemicals; wetland restoration barely moved the needle toward its 85,000-acre goal; and tree planting along sensitive rivers and streams hit a 22-year low. For the first time, the report assessed the impacts of climate change. It found that average air temperatures have risen up to 3 degrees since 1901 in southeast Pennsylvania and all of Maryland east of the Allegheny Mountains. Temperatures rose an average of 2 degrees in many streams, a bad sign for brook trout, which need cold water to survive. Tide gauges show small but important variances in sea level rise since 1960, ranging from 7.1 inches in Baltimore to 10.4 inches at Sewell’s Point, VA, near the Bay’s mouth. Sea level rise in the southern part of the watershed appears to be accelerating faster because groundwater withdrawals in the region are causing the land to sink more quickly, scientists say. The inclusion of climate statistics comes after the Bay Program last year agreed to a strategy to deal with climate change, which scientists worry will make the job of meeting Bay water quality goals even more difficult. It calls for states to lay out how they will address climate change in their Phase III Watershed Implementation Plans and, by March 2021, revise nutrient and sediment reduction goals to account for climate impacts on Bay water quality. In 2011, an influential study by Johns Hopkins University and the University of Maryland Center for Environmental Science found that reducing nutrient pollution and other efforts had helped shrink the size of the Bay’s summer “dead zone,” an area of oxygen-starved water containing little or no life. But it also showed that changing climate forces were causing the dead zones to proliferate in early summer. “It just goes to show the climate signal makes us have to work harder to meet our … nutrient reduction goals,” said Bill Dennison, an UMCES scientist. Over 30 years, the Bay Program’s monitoring has depicted incremental water quality gains set against a backdrop of unpredictable, weather-induced swings. Wet years such as 2003, 2004 and 2011 tend to be followed by higher loads of water-fouling nutrient pollution and murkier water. Each time, however, the Bay recovered. Scientists and advocates hope that is the case in the wake of 2018, when heavy rainfall in late summer and fall tinged parts of the Bay the color of chocolate milk for several weeks. “The work of the collective movement is making a positive difference, in spite of daunting challenges like known, and unknown, climate change impacts. We continue to see the responses of a resilient ecosystem, which indicates that our efforts are working,” said Kate Fritz, executive director of the Alliance for the Chesapeake Bay. Take underwater grasses. The aquatic meadows are the nursery ground for fish, blue crabs and other aquatic life. In 2017, surveys showed that their acreage had topped 100,000 acres for the first time since monitoring began more than 30 years earlier. But there was widespread concern after last year’s rains that the cloudy water would cause a mass die-off. Researchers were heartened by their initial glimpses after the rains let up. Some of the largest expanses, including the Susquehanna Flats, appeared intact, said Brooke Landry, a biologist with the Maryland Department of Natural Resources and chair of the Bay Program’s underwater grass workgroup. But they had difficulty completing routine aerial surveys because of poor weather and new air-space restrictions. Landry and her colleagues are trying to use satellite imagery for the first time to fill in the gaps, she said. The total amount of grass stands at 57%of the program’s 185,000-acre goal. The regional water quality monitoring program involves more than 100 stations around the Bay and its tributaries, where 12–20 water quality samples are taken per year. The first three-year assessment period revealed an overall water quality score of about 26%. The score has climbed 16 percentage points in the intervening 30 years. If that rate remains steady, the Bay can be expected to hit 100% by 2126.